In June 2008, NATURE checked in with Pennsylvania’s acting state beekeeper, Dennis van Engelsdorp, for an update on the latest details on the investigation into Colony Collapse Disorder. Q: In Silence of the Bees, you are shown monitoring a quarantine of several collapsing hives from a Pennsylvania beekeeper. Is this monitoring ongoing? A: All of the original colonies died by December . We now have eight new colonies at that site, and continue to sample once a week. We are watching disease growth curves, and this year we are sampling a more diverse range of bees. What have you been hearing recently from other beekeepers? 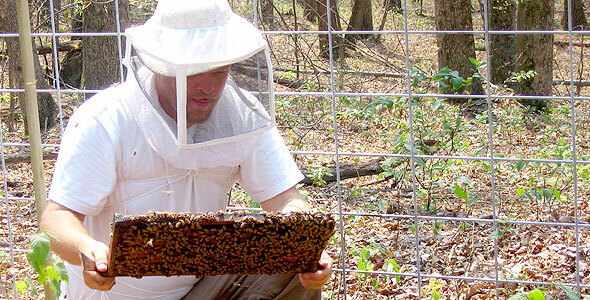 The Apiary Inspectors of America (AIA) commissioned a survey to estimate colony losses across the country between September 2007 and 2008. The USDA-ARS Beltsville Honey Bee Lab conducted a similar survey of beekeepers pollinating almonds in California in February 2008. In total, nearly 19 percent of the country’s estimated 2.44 million colonies were surveyed. A total loss of 36 percent of managed honey bee colonies was recorded. This represents a 13.5 percent increase in total losses as compared to last year. The 327 operators surveyed lost nearly a third of their colonies, on average. Are all of these losses attributable to CCD? It’s important to keep in mind that at least 71 percent of all colony deaths can be attributed non-CCD causes. This really emphasizes the need for further research into pollinator health in general — not just CCD. Last October NATURE Online reported the research breakthrough that Israeli Acute Paralysis Virus (IAPV) had been found in over 96 percent of bees from CCD-affected hives. This doesn’t mean that IAPV is the only — or even the main — culprit behind CCD, however. Could you tell us about what has been learned since that time about the role IAPV may play in CCD? Research published in September 2007 showed that among known pathogens, IAPV was the most consistent indicator of CCD. And it was found in at least 19 states. However, Kashmir Bee Virus (KBV), and two microscopic spore parasites — Nosema apis and Nosema ceranae — were also found to be indicators of CCD. Also, no clear cause and effect relationship was found between IAPV and CCD. Not all colonies with IAPV die off, and it’s possible that other stress factors are needed to make IAPV deadly to bee colonies. Besides IAPV, how has the investigation evolved since last fall in regard to the other potential causes, such as pesticides and varroa mites? What kinds of studies are going on now? We are in the final stages of receiving individual colony analysis on pathogens and pesticides from the original data set and are analyzing and writing up these results. IAPV cannot explain CCD losses by itself, and other factors are being examined. Last year we monitored 280 colonies as they moved up and down the East Coast. We are processing this data, to test some predictors of disease based on last year’s studies. We’ve also discovered some new conditions that seem to be affecting survivorship, and we are trying to figure out what exactly these are. The effort to look at the impacts of pesticides has reveled a surprisingly large number of different pesticides in pollen, wax, and the bees themselves — and some of these at high levels. These pesticides are used in agriculture and sometimes by the beekeepers themselves. We have initiated investigations into the sub-lethal effects of pesticides, potential synergistic effects of multiple pesticides, the impact of pesticides in combination with other stress factors — like IAPV or varroa mites — and the use of irradiation to mitigate pesticides residues. In many media reports on CCD, there is a feeling of inevitability that suggests that beekeepers are just waiting for CCD to decimate their hives. What can beekeepers do now? Beekeepers are advised to practice good hygiene with their hives. For example, they shouldn’t combine weak colonies with stronger ones or exchange colony hardware. This kind of contact can spread diseases. Beekeepers should irradiate “dead-out” equipment — or at least store it for as long as possible — before reusing it with other colonies. There are also products that beekeepers can use to control other colony stresses, like varroa mites and other parasites. And because nutrition is a concern, beekeepers should make sure their colonies are well fed, especially with a protein supplement. Many of our viewers are interested in doing whatever they can to help. What would you tell them? There are many things people can do: become a beekeeper, support beekeepers by buying local honey, plant a pollinator garden, and use less pesticides.